Early treatment of cataracts is necessary because Indonesia is a developing country that produces productivity from the community. 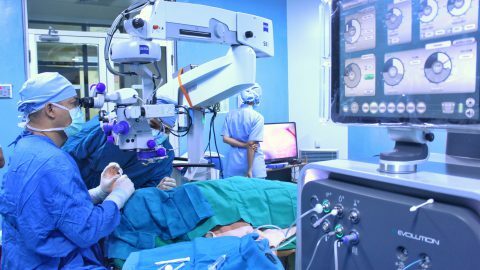 The most commonly used technique is still a conventional technique often known as ECCE (Extracapsular Cataract Extraction), with the advantages of affordable operational costs, and the use of less expensive consumables. The new technique used for current cataract surgery is Phacoemulsification or known as cataract surgery without stitches. Operations that use only 2.75 mm incision even today have been developed to only 1.2 mm is a form of progress in cataract management. The eyepiece is broken down into sections and then sucked for further installation of folding lenses. The advantage of cataract surgery using this method is rapid recovery time, and only topical anesthesia is required in the process so that the patient is preferable and the action can be outpatient. The retina is a layer of nerves in the back of the eye, functioning to convert light into the eye into electrical signals which are then translated by the brain to be transformed into the shape of the image we see daily. Retinal Blood Vessels Retina refers to a variety of eye diseases that affect the blood vessels in the eye. This condition is connected with existing blood vessel diseases, such as high blood pressure, diabetes mellitus and atherosclerosis (thickening of artery walls). High blood pressure (hypertension) and diabetes cause the blood vessels of the eyes to narrow, leak and harden over time due to excessive blood pressure and can affect blood vessel walls. In some cases, this can cause optic nerve disorders and lead to vision problems. 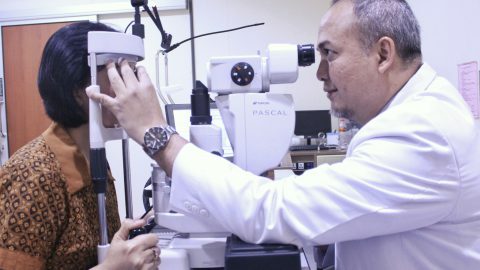 Kasih Ibu Hospital's Retina Clinic has advanced diagnostic tools for diagnosing and treating retinal diseases such as Age Related Macular Degeneration, Polypoidal Choroidal Vasculopathy (macular degeneration causing bleeding in the eyeball), Central Serous Chorioretinopathy (swollen macular center due to leakage of retinal blood vessels), Diabetic Retinopathy, Diabetic Macular Edema (macular swelling caused by diabetes) and retinal detachment. 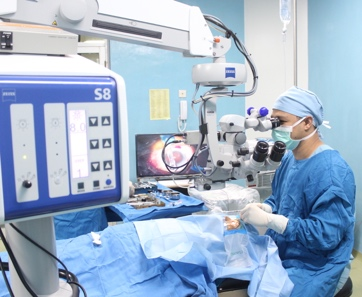 In addition, there are also medical treatments (laser and intravitreal injections) and surgery that are handled by the Retina Subspecialist Doctor.